Earlier this year I attended a bookseller’s conference, where, in one session, two authors had to present a Gruen-like pitch for their forthcoming novels. The winner was Melbourne-based author Katherine Collette. She had us all in stitches with her hilarious pitch for The Helpline. Curious to see if Collette’s first novel was as funny as her presentation, I eagerly volunteered to take on the task of reviewing it. Germaine Johnson is very good at understanding numbers, but not so good at understanding people. When Germaine loses her job at Wallace Insurance, she discovers there aren’t too many prospects for a mathematician of her calibre. With her meagre funds running low, Germaine reluctantly accepts help from her cousin, Kimberly, who gets her a job with the local council. Initially her role is answering calls for the senior citizens helpline, but it’s not long though before the mayor, Verity Bainbridge, assigns Germaine to a secret project – to orchestrate the closure of the senior citizens centre, which is causing trouble for the neighbouring golf club. The golf club is owned by the handsome Don Thomas, whom Germaine recognises as the disgraced sudoku player Alan Cosgrove. Keen to further her career, and to impress Don, Germaine takes to the assignment with vigour. Of course, things don’t quite go to plan and Germaine finds herself growing to like, and to become friends with, the very people she is working against. Inspired by real-life events involving a tyrannical president of a senior citizens centre, Katherine Collette has created an endearing story about power, ambition, greed and friendship. 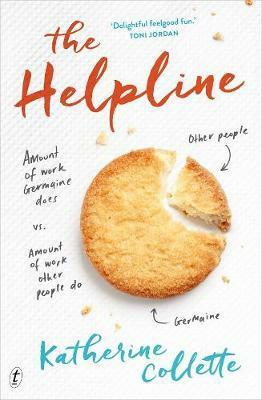 The Helpline is a lighthearted, feel-good novel that will no doubt appeal to fans of both The Rosie Project and Eleanor Oliphant is Completely Fine.